Wall Planner | How can I recycle this? 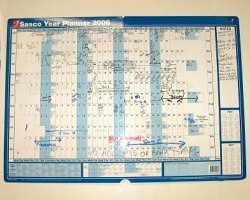 How can I reuse or recycle an old wall year planner? Can big paper wall planners be recycled? We’ve got at least a dozen at my school to get rid of now but I didn’t know about recycling them in the paper bins because they’re laminated. No, it’s very unlikely that they’ll be accepted for paper recycling. Most wipe-clean plastic-coated paper – whether it’s actually laminated or just a thin coating on one side – is also more hassle than its worth when it comes to recycling. There might be ways to reuse them though – we covered reuses for laminated posters last year and there is probably a big overlap for reuses (especially as a lot of those ideas are school-friendly). It’s probably also worth investigating if you can get reusable wall planners for the future – dry erase ones without a specific year on them so you won’t have to throw them out each summer.